Villa Giulia is the result of an authentic restoration of an ancient Aeolian house. With a good level of furniture and its proximity to sea, it well combines comfort requirements and the great charm of the typical Aeolian houses. 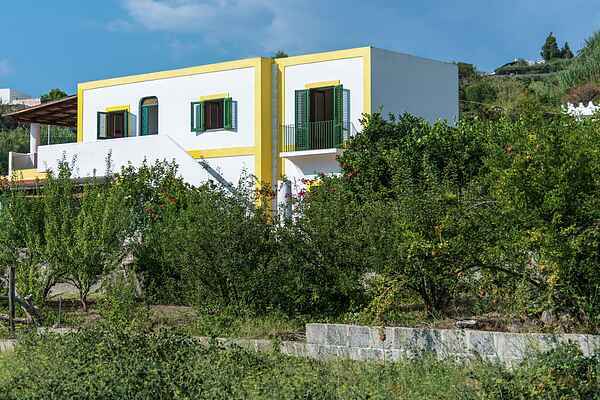 Freshened in front by a gentle sea breeze, on the other side the house offers a great view on Mount Fossa delle Felci and Hauner's vineyards producing the legendary Malvasia. Villa Giulia includes 2 houses, each one with an indipendent access for a maximum capacity of 12 guests. This island group is part of UNESCO world heritage! How to get to the Island of Salina BY SEA: From Milazzo By ferryboats: By Siremar, or N.G.I. Several trips every day. The cost per passenger is about €6, per car about €40. The journey time is about 3 hours. NGI www.ngi-spa.it SIREMAR CALL CENTER 199.123.199 Ticket offices: www.siremar.it By Hydrofoils: Siremar and USTICA lines. Several trips every day. Cost per passenger is about € 18. The journey time is 90 minutes. We recommend booking in advance for August. From Reggio Calabria (airport connection) and Messina By Hydrofoils: USTICA lines. A daily trip during winter, several during summer. The cost per passenger is 25.50 Euros. The journey time is 2.5 hours. From Naples: By Ferryboats: By Siremar. Two trips per week all year round. The trips are during the night-time. The cost per passenger (without a cabin) is about € 36, per car about € 150. The journey time is about 13 hours. By Hydrofoils: By SNAV. Only in summer, cost per passenger is about € 70. The trip takes about 5 hours. CALL CENTER 081.4285555 www.snav.it From Palermo (airport connection): By hydrofoils: By USTICA lines. Daily during the summer. Cost per passenger is about € 40. The trip takes about 2.5 hours. USTICA LINES CALL CENTER 0923.873813 www.usticalines.it BY CAR OR TRAIN If you wish to reach Salina by car, you can use the ports of Naples (by Siremar) and Milazzo (by Siremar and N.G.I.). By train (Trenitalia), you have to stop to Milazzo train station and to get a taxi to the port (approx. 5 min) www.trenitalia.com BY HELICOPTER Air Panarea Booking: +39 - 340 3667214; +39 - 090 9834428.